Our sister site, TruTower, now has an updated app for Windows 10 Mobile that includes some speed improvements, updated UI, and more. Like the 1800Pocket/PC app before it (which did get an additional minor update today as well), this latest update focuses on improving both the form and function of the app and improving the overall experience. The old version of the TruTower app lagged when loading news articles and images, and sometimes it wouldn’t even load the content at all. The most noticeable difference between the new release and the previous version is the UI (user interface), which has been modified with not only a new color, but also a whole new layout. Rather than featuring only the images on the article lists, the app now shows the titles and short previews of the articles, making them easier to discern. It also presents the articles in chronological order, while the old version had them in reverse chronological order. The image sizes have been increased, the font is more easily readable, and there’s even more content to enjoy than before. The RSS feed load has been improved, both on the server side and the app side, giving the app a snappier response time. 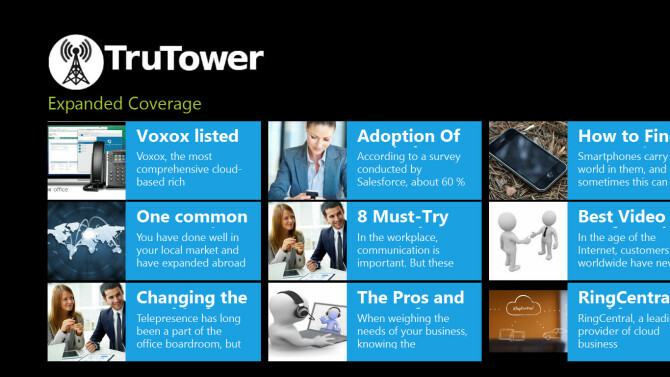 As for what’s coming in the future, the TruTower app’s live tile will see some new upgrades and more content will be added. Additional features and improvements will depend on user feedback, which can be given inside the application itself. Download TruTower on your Windows 10 or Windows 10 Mobile device via the QR code and download link below.